Join David I for a FREE technical online workshop and be one of the first to see the latest RAD Studio XE8! Learn about the features and benefits of using Embarcadero's latest version of RAD Studio XE8 for cross-platform app development. Choose from a lunchtime session May 13th at your desk or join David I and Embarcadero Technical Experts online on May 16th for a very special Saturday deep-dive RAD Studio XE8 online workshop. You’re invited to join our Q2 2015 “Embarcadero Technology Partner Spotlight” series of webinars each Thursday for 20-minute online presentations and demonstrations followed by live Q&A with the best tool and component companies on the planet. Enterprise Mobility Services (EMS) is a multi-tier framework in RAD Studio, Delphi and C++Builder. This white paper is designed to provide you, the software professional, with the information you need to get started with EMS today. Topics include a general overview of EMS, getting started with your first application, extending applications with custom REST endpoints, authentication and authorization, server and client side development and much more. DEVELOPER SKILL SPRINTS: Check out these New Session Topics! This season of Developer Skill Sprints focuses on rapidly designing, coding and extending connected apps across Windows, Mac, iOS, Android and IoT. Upcoming topics include "Unit Testing with DUnitX" on May 12th, "How to Understand User Behavior with AppAnalytics" on May 19th and "Coding Productivity Tricks" on May 26th. Register now to see them all! Join David I for this informative webinar as he shows you how to use the new RAD Studio XE8 support for Proximity Beacons and Enterprise Mobility Services Push Notifications to build a modern medical application solution for a hospital or doctor’s office. Here are some recent blog posts on the Embarcadero Community web site that you won’t want to miss. After you read the posts, click around on the Community site and you will find Answers, Forums, Articles, Events and get a chance to interact with other developers in the community. 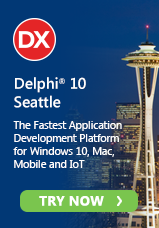 If you aren’t using the new XE8 versions of Delphi, C++Builder or RAD Studio yet, now is the time to take the next step and try or buy. You can save big, get extra tools free or even win a Samsung Android tablet.